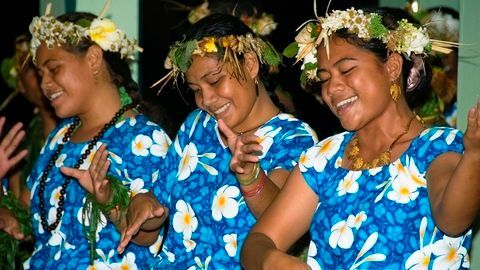 Tuvalu is considered one of the smaller 'off the beaten track' type destinations in the South Pacific and a recent traveler's blog published by the South Pacific Tourism Organisation (SPTO) offers travelers an insight into 'ten things to do' on timeless Tuvalu. The traveler's blog is a result of a travel familiarization initiative funded by the European Union to facilitate the production of travel blogs and articles to assist the tourism industry in Tuvalu recover following the severe tropical cyclone Pam, which struck Tuvalu in March 2015. Australian travel writer Louise Southerden visited Tuvalu and captured in the traveler's blog some interesting discoveries about her visit to one of the most remote nations in the world. SPTO Chief Executive, Ilisoni Vuidreketi, said the articles written by Louise Southerden of Australia provide wonderful insights into travel in Tuvalu. Aussies might celebrate Australia Day with more gusto than other national events, with new data revealing that sickies are more common after 26 January than after Anzac Day, Melbourne Cup and footy grand final weekends. The survey of 2,024 Australians by Clipp, Australia's leading and fastest-growing mobile-payment and deals app for bars, pubs and their restaurants, revealed that 16 per cent of Aussies have chucked a sickie after Australia Day at least once, compared with 10 per cent on Anzac Day, 10 per cent after Melbourne Cup, and eight per cent after footy grand final weekends. "On the flipside, 84 per cent of respondents haven't chucked a sickie after Australia Day, which is good news for employers who may have concerns about staff calling in sick," said Greg Taylor, co-founder and CEO of Clipp. "And of the 16 per cent admitting to chucking a sickie after Australia Day, just seven per cent said they have done it 'a few times'. Australia Day occurs at the end of a long January holiday for many Aussies, so there is little motivation to sneak in a sickie. Unlike sporting weekends, we also tend to see January 26 as more of a relaxing day to spend with family." Interestingly, older Australians appear to value their work benefits and entitlements more, with younger Australians leading the charge when it comes to calling in sick after Australia day. One quarter (24 per cent) of those in their 20s admitted to doing so – of that, 13% said they had done it once while 11% said they'd done it a few times. This is closely followed by under 20s at 22 per cent (17% once and 6% a few times) then 16 per cent of 30-somethings, 12 per cent of 40-somethings, nine per cent of 50-somethings and four per cent of 60+. When gender comes into play, males are more likely to have a sickie (17%) than females (14%), and while more admit to chucking a sickie once (9% each), eight per cent of males admit to doing it more than once, followed by six per cent of females. Sydneysiders and Melbournians are similar, with 15 and 16 per cent respectively having admitted to taking the day off at least once after Australia Day. According to National Geographic, the city of Thessaloniki, Greece's second largest city in the north, is among the top 20 international destinations not to be missed by travelers. The renowned magazine, which reaches more than 8 million readers worldwide, recently released its annual travel guide for 2013, naming Thessaloniki among the top destinations worldwide and a must see place for next year. As the magazine states, "Although the euro crisis has caused ripples of discontentment here, it's the century-old street markets filled with ripe fruits and barrels of fresh feta that symbolize this city. Tucked between relics of Byzantine and Ottoman antiquity are art galleries, bohemian nightclubs, and culinary hot spots, all part of a grassroots vision turned reality by Thessaloniki's large do-it-yourself youth culture. The best way to get the feel of this mission-driven city is on foot, walking from the ruins of Ano Poli to Aristotelous Square on the waterfront. Then cozy up to a café to nibble grilled calamari washed down with dry Macedonian wine". The article also focuses on the city port, which it calls "luminous", due to the fact that it is not closed by any gigantic construction like so many others is southern Europe. Εxcept for a beautiful city-break destination on its own, thanks to its location, Thessaloniki is also the holiday gateway to the north Aegean Islands and the Halkidiki region, famous for its natural beauty and mesmerizing beaches, as well as a short trip getaway to famous archaeological sites, such ancient Pella and the Vergina royal tombs. Moreover though, due its 3,000 year old history, examples of its Roman, Byzantine and Ottoman past, such as Byzantine churches, included in UNESCO's World Heritage list, are scattered around the city. This is not the first major acknowledgement received by Thessaloniki. Many more leading newspapers and travel guides have also discovered Thessaloniki in the recent past. In 2010 Lonely Planet, the leading travel guide, included the city in the top 10 destinations in the world in terms of entertainment. In 2011, the annual Louis Vuitton City Guide - European Cities publication included Thessaloniki in its list of unexpected cities, due to the unique wine and culinary experiences it offers. That same year, the New York Times included it in the top 41 destinations to be visited in 2011, while the Australian Sun Herald, added the city at its list of proposed European travel destinations.